Here’s a recipe for wild mushroom and roasted chestnut stuffing that will add some rich, earthy flavor to your Thanksgiving feast or any time inside a meat loaf, a rolled up flank steak, or a pork chop. 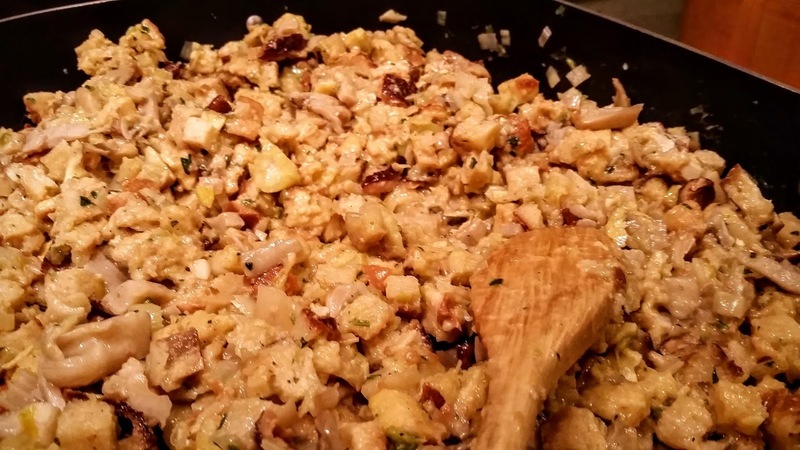 I started making this stuffing many years ago. I have been growing shiitake mushrooms on logs placed on a wooded area of our property. They typically flush with a lot of mushrooms in early fall. I partially sauté them and freeze in packages that roughly equal one pound of fresh mushrooms. 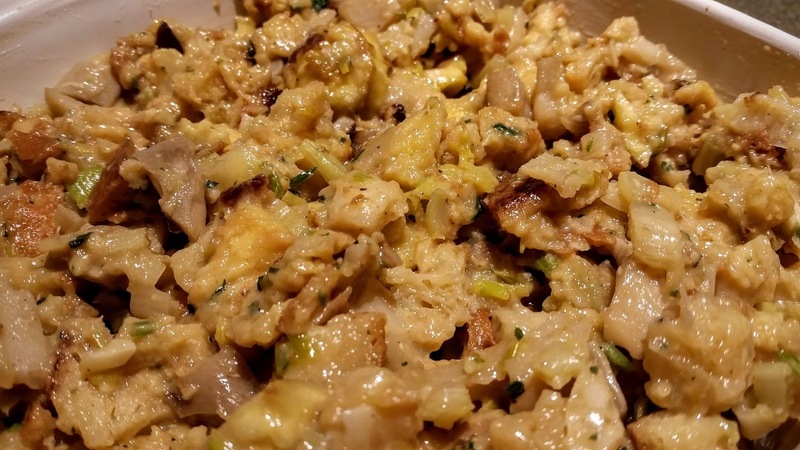 For this recipe, I was originally looking for some way to give my normal stuffing some more seasonal flair, and I had all of these mushrooms, as well as another seasonal treat, chestnuts. 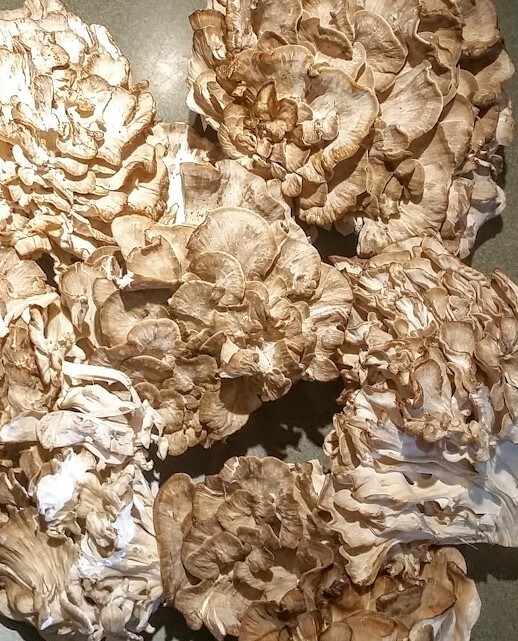 This year I am using some really nice Hen of the Woods mushrooms that my friend Lynne foraged and was kind enough to give me about 15 pounds’ worth! We’ve had them with crab imperial, in cream of mushroom soup, in venison stroganoff, on steak, and most recently, in a nice pot roast. They are woodsy flavored, and like shiitake, remain firm when cooked. This will add a very nice texture contrast in the stuffing. Hen of the Woods is a common name for Grifola frondosa mushrooms. They are sometimes sold commercially in exotic mushroom packs. They may also be called Maiitake. Don’t worry if you can’t find them because shiitake are perfect for this recipe. Start by cleaning and sautéing a pound of sliced mushrooms in some butter. Salt and pepper to taste. Remove to a bowl and reserve. You’ll also need to prep your chestnuts ahead of time. You’ll need about 2 cups of chestnut meat for this dish, but I usually start with at least two pounds of whole chestnuts to leave some for snacking and in case some need to be tossed if they are discolored. If you choose to roast your chestnuts, slit the shell open and roast in a pan in a 350F oven for about 40 minutes, until you smell them getting browned. As soon as they are cool enough to handle, pull off the shells. If they break into pieces, it’s OK. While a few big pieces of chestnut are good in this stuffing, smaller pieces make a better finished flavor, I think. Another way to quickly prep a lot of chestnuts is to just cut them in half and boil them. When they are done, they will start popping out of their shells. Of course, if you are really in a hurry, then you can buy packs of pre-shelled roasted chestnuts. I often have these on hand just because they are such tasty snacks. The last thing which needs to be prepped ahead is your bread. I usually save up stale homemade bread for a while before I make this. Cut it in small cubes and toss it in the freezer. You can really use any bread you like, and you can even buy the cubed bread they sell specifically for stuffing. Since it’s Thanksgiving, you probably have an oven that was just used for something. Right after you turn off the oven from cooking something else, spread two loaves of cubed bread on a sheet pan, and place the pan in the oven. Every ten minutes or so, stir the bread around so that it dries out evenly. If you have good timing, you can roast the chestnuts and then toast the bread cubes while you are peeling the shells. I’m almost always multi-tasking in the kitchen, so I just go with things as they seem most efficient at the moment. 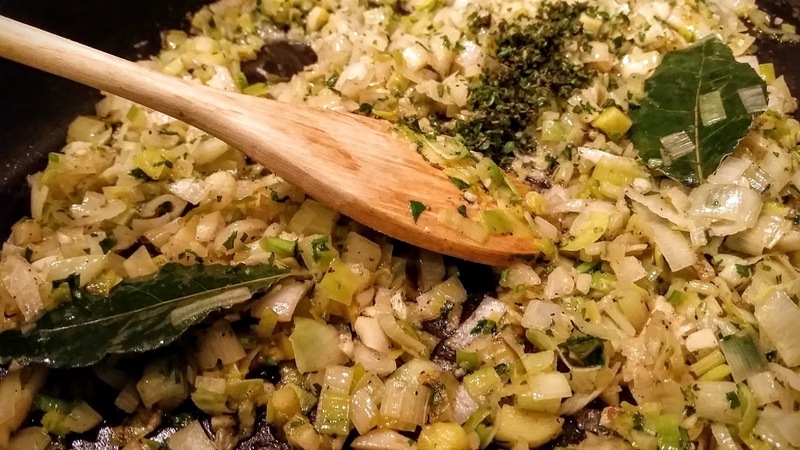 OK, now you’re ready to make this stuffing. I use my biggest roast pan for this. It goes over two burners on the stove, but it does not need them both to be lit. 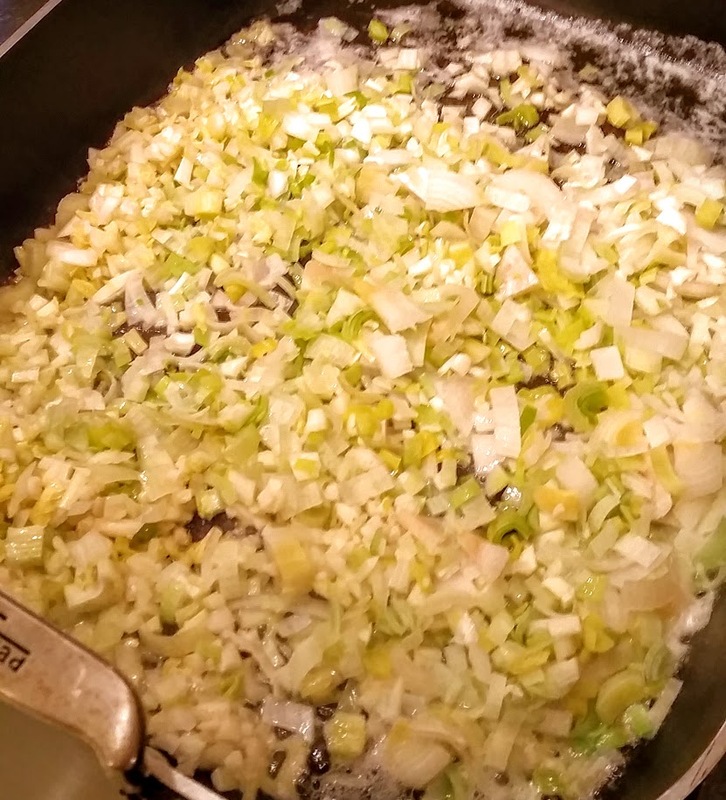 Melt the butter and add the leeks, garlic, and celery. Cook until they are soft, but not browned. Add the fresh herbs. Add 2t salt and 1t pepper, more or less to taste. With the heat still on, mix in the bread cubes. Turn off the heat and then slowly pour the eggs over the bread and stir again to evenly distribute. Next, do the same with the warmed turkey stock. Mix well. Last, fold in the mushrooms and chestnuts. Turn the heat back on medium to slightly set the stuffing. Chill the stuffing overnight. If you stuff this inside of your turkey, then microwave it to preheat to 160F. Stuff the turkey and truss it right before it goes in the oven. Preheating the stuffing makes sure the stuffing is cooked by the time the turkey is done. 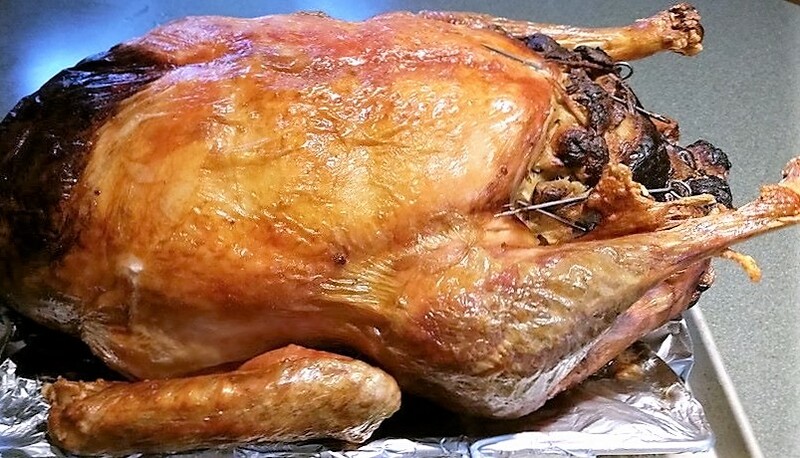 I stuff both the cavity and the neck of the turkey, and then use small metal skewers and twine to lace the openings closed. If you have stuffing that does not fit in the bird, or if you prefer to cook the stuffing separately, cook it in a buttered casserole. Dot the top with butter and bake in the oven for about 45 minutes at 350F or 30 minutes at 400F, depending where your oven is set for other dishes. It’s done when it has a nice brown crust on top, but is still soft and moist underneath. Serve with gravy, of course!